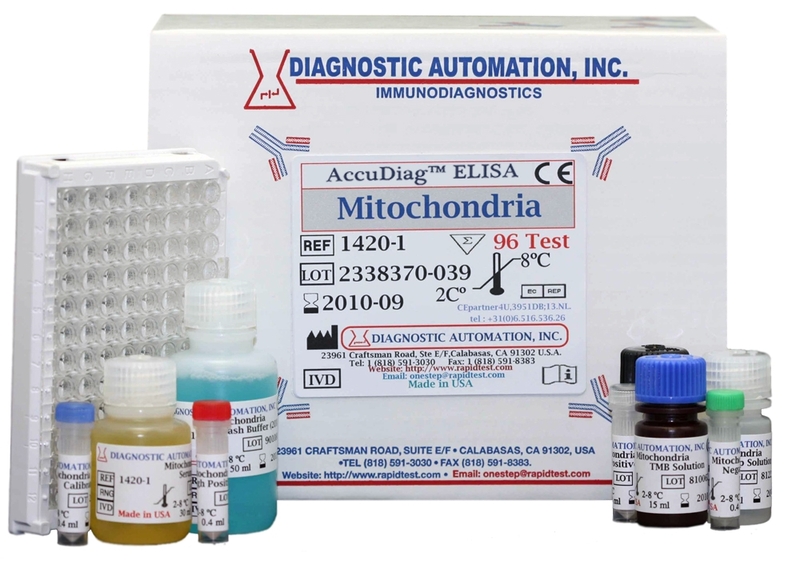 The Diagnostic Automation Mitochondria ELISA test is intended for the detection and semi-quantitation of antibodies to mitochondria in human sera. 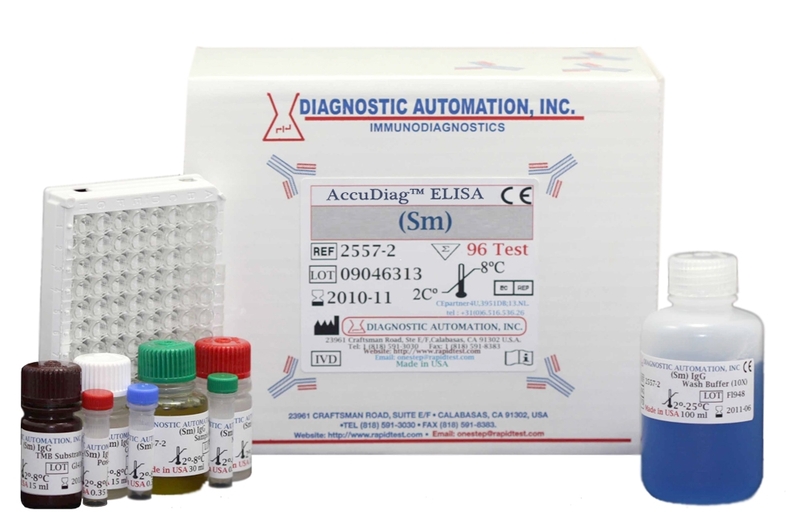 This Mitochondria Elisa kit is for detecting antibodies in a single serum specimen and the results of this assay can be used an aid to the diagnosis of primary biliary cirrhosis. Systemic autoimmune disease is characterized by the presence of circulating auto-antibodies directed to a wide variety of cellular antigens. Systemic lupus erythematosis (SLE), commonly referred to as Lupus is the best known of these diseases. Other possible connective tissue diseases include mixed connective tissue disease (MCTD), Sjogren syndrome, scleroderma, and polymyositis/dermatomyositis. The majority can be diagnosed by clinical presentation and their antibody profiles to the various antigens involved, which include dsDNA, Sm, RNP, Ro, La, Scl-70, Jo-1 and Histones. 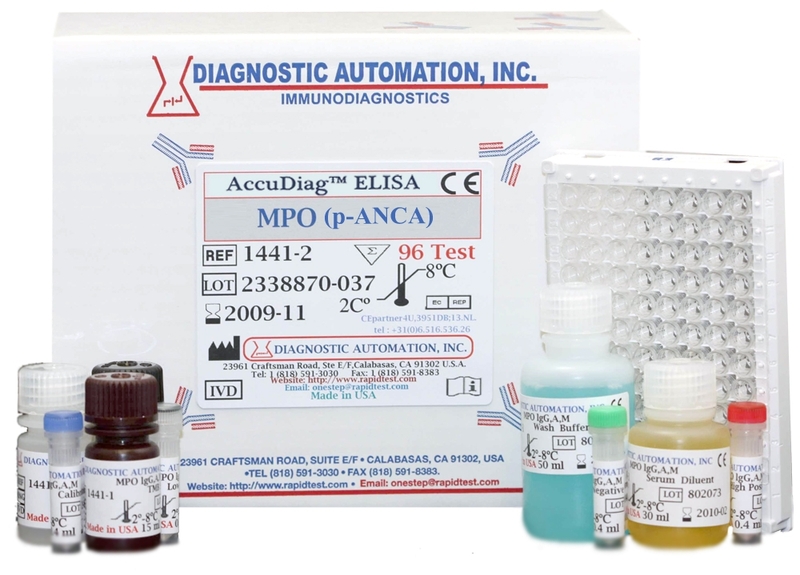 Therefore, immunoassays for autoantibodies are useful for diagnostic and prognostic evaluations of autoimmune disease. Anti-mitochondria antibodies occur occasionally in other liver conditions and scleroderma. The antibody is rarely seen in other conditions. Classically, antibodies to autoimmune antigens are detected by double immunodiffusion. However, the Mitochondria test kit is lengthy and suffers from weak sensitivity. Enzyme-Linked Immunosorbent Assays (ELISAs) combine greater sensitivity with ease of use. 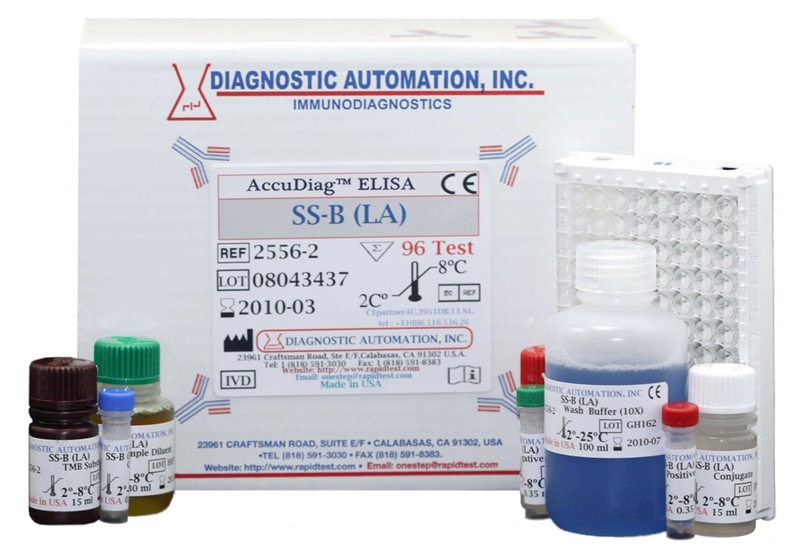 Many ELISAs have been developed and validated for detecting autoantibodies to various antigens. 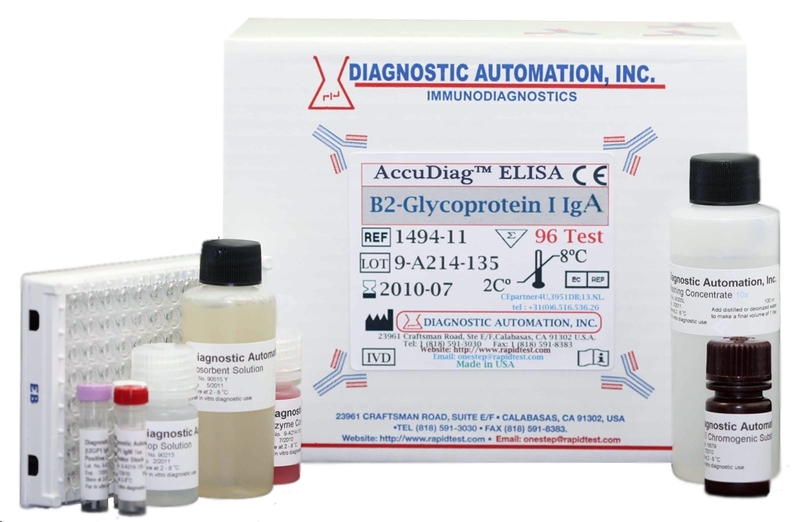 The DAI Mitochondria elisa test is an Enzyme-Linked Immunosorbent Assay to detect IgG, IgA, and IgM antibodies to Mitochondria antigens. Purified Mitochondria antigens are attached to a solid phase microassay well. ELISA rely on the ability of biological materials (i.e., antigens) to adsorb to plastic surfaces such as polystyrene (solid phase). When antigens bound to the solid phase are brought into contact with a patient's serum, antigen specific antibody, if present, will bind to the antigen on the solid phase forming antigen- antibody complexes.